The best mix of sweets to keep you awake long enough to talk about all the things you need to catch up on. Tried and tested. What could make a girl's night in better, other than an endless supply of yummy treats? 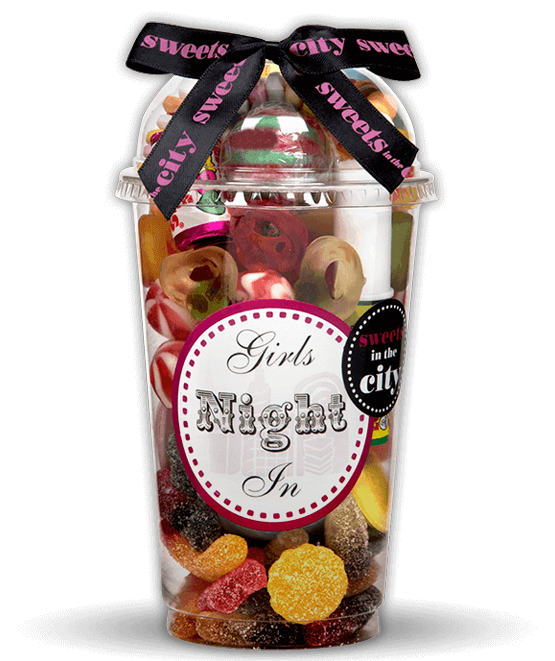 We've got all the girls night sweets you could want in our delicious mix, each has been specifically selected to fit with the girls night theme. Everyone knows a girl's night is all about indulgence: whether that comes in the form of guilty pleasure music, chic-flicks or a good amount of gossip, it's always best-accompanied by some girls night in treats! 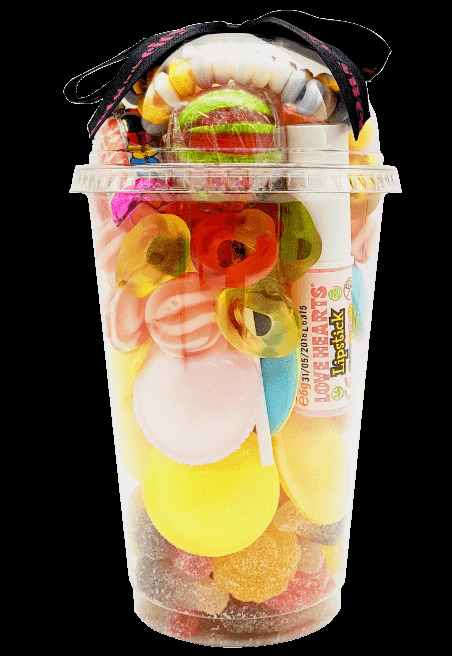 Includes Candy Lipsticks, Gourmet Lollipops, Candy Necklaces, Love Hearts, Jelly Friendship Rings, Strawberry Twist Kisses, Fizzy Mixture and Flying Sources. After sharing this jar you're sure to be friends forever. There's more than enough to go around - just tell the boys to keep their hands off! Product 1: Sugar, glucose syrup, water, pork gelatine, acids: E296, E334; flavourings, colours: E100, E120, E141, E150d, E160c, E160e. Product 2: Sugar, dextrose, maize starch, acid: tartaric acid; acidity regulator; sodium hydrogen carbonate; flavourings, colours: E100, E132, E162. Product 3: Sugar, glucose syrup, acidity regulators: citric acid, malic acid; flavouring, colour: E120. May also contain MILK, NUTS, SOYA and GLUTEN. Product 4: Glucose syrup, sugar, beef and pork gelatine, corn starch, humectant: sorbitols; acids: lactic acid, citric acid; modified potato starch, gelling agent: pectins; flavourings, fruit and veg concentrates: radish, pumpkin, apple, tomato, blackcurrant, carrot; coconut and palm kernel oil, glazing agent: carnauba wax, beeswax; colours: E120, E171. Product 5: Glucose syrup; sugar; gelatine; dextrose; acid: citric acid; flavouring; fruit & plant concentrates: apple, aronia, blackcurrant, elderberry, grape, kiwi, lemon, mango, nettle, orange, passion fruit, spinach; glazing agents: carnauba wax, beeswax; caramelised sugar syrup; invert sugar syrup; elderberry extract; carob extract. Product 6: Dextrose, glucose syrup, anti-caking agents (magnesium salts of fatty acids, mono-and diglycerides of fatty acids), acid (citric acid), maltodextrin, natural flavourings, vegetable oil (coconut), colours (paprika extract, anthocyanins, beetroot red, beta-carotene). Ingredients on Wrapper (Love Hearts, Love Hearts Lipstick).